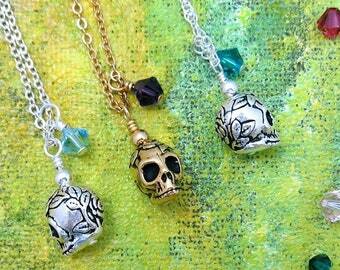 Rose skull necklace - sterling, gold or silver plated, choice of Swarovski. Alternative wedding, gothic bridal jewellery, memento mori gift. 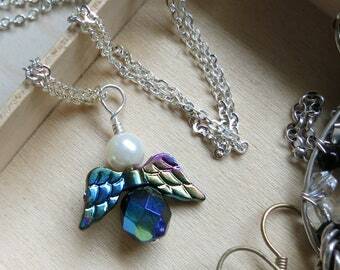 Guardian angel wing pendant, iridescent black and faux pearl on silver plated necklace. Memorial, blessing, protection or good luck gift. Black cat earrings. 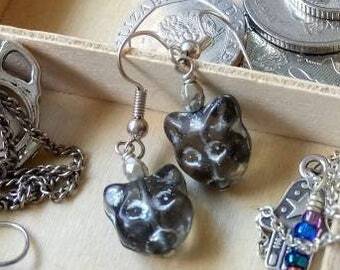 Translucent black glass cat faces, silver plated drop earrings. Cat lover, mad cat lady or good luck black cat gift. 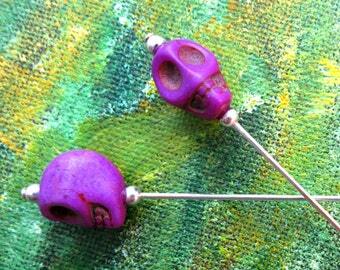 Gothic Valentine Rose pattern skull pin. Gold plated, choice of accent colour. Lapel, tie, cravat, hat or scarf pin, brooch or boutonniere. Announcement Let someone know that you want to keep them safe, get them an evil eye bead for Valentines day. Let someone know that you want to keep them safe, get them an evil eye bead for Valentines day. Half Price: Slight Seconds. Stick pins with minor defects. Angel wing and skull jewellery. Gold hamsa hand brooch with blue glass center. Protective gift, stick pin, lapel pin, tie pin, Hijab pin. 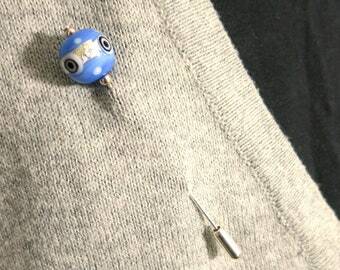 Hamsa charm pin brooch in Blue and Silver. Hand of God or Hand of Fatima, groom's Something Blue for wedding, or good luck gift. 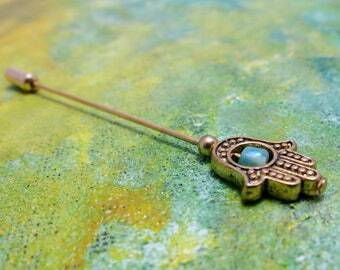 Turquoise blue and Gold hamsa hand brooch. 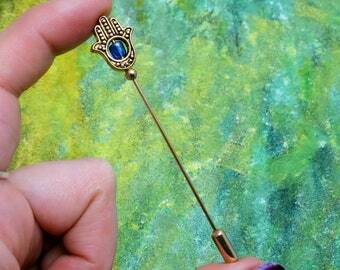 Protective Hand of God stick pin, lapel pin, tie pin, Hijab pin, blessing or good luck gift. 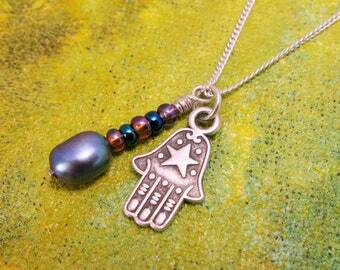 Delicate silver hamsa hand and Freshwater pearl charm necklace. Protective Hand of God with purple peacock pearl. 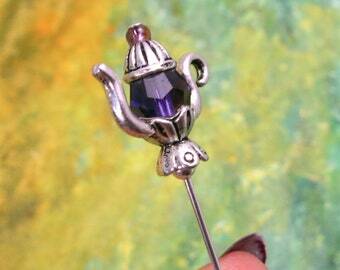 Purple Teapot pin. 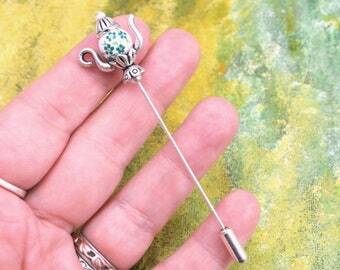 A tea lover gift to wear as a lapel pin, tie pin, hat pin... Perfect for a tea drinking father's day gift. 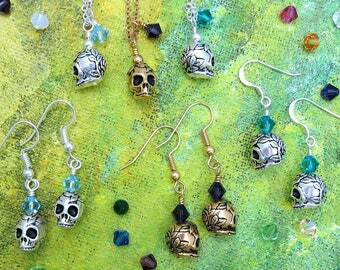 Rose skull earrings - sterling, gold or silver plated, choice of Swarovski. Alternative wedding, gothic bridal jewellery, memento mori gift. 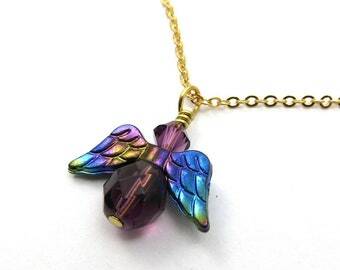 Guardian angel charm pendant, purple glass and iridescent acrylic wings on gold plated necklace. Memorial, blessing, remembrance gift. 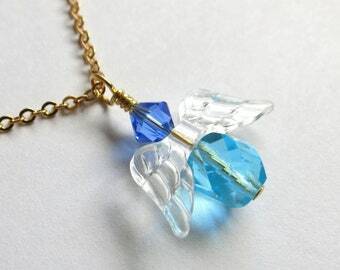 Blue Guardian angel wing pendant, on gold plated necklace. For memorial, blessing, Confirmation, Baptism or First Communion. 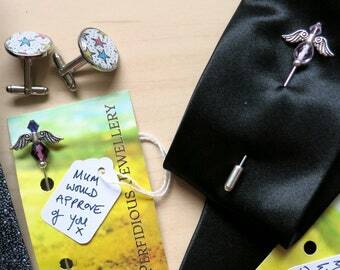 Pair of Angel wing pins, choice of 10 colours. Memorial gift or wedding jewellery. Bouquet charm pin, lapel pin, tie pin, boutonniere. 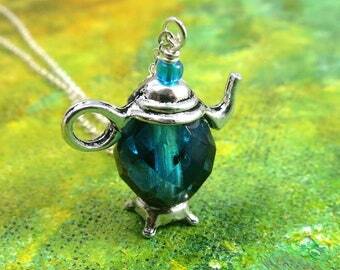 Blue two ways to wear miniature teapot necklace, double sided, clear or iridescent. 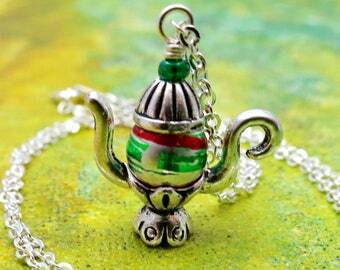 Tea lover gift, afternoon tea jewellery, tea drinker. 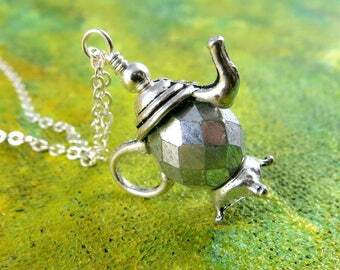 Miniature silver tone teapot charm necklace: Tea pot jewellery, Tea lover gift, perfect for a Victorian or Steampunk afternoon tea party. Purple skull Day of the Dead lapel pin, brooch, cravat pin, hat pin. Howlite skull jewellery for dapper chaps, goth teens, stocking fillers. 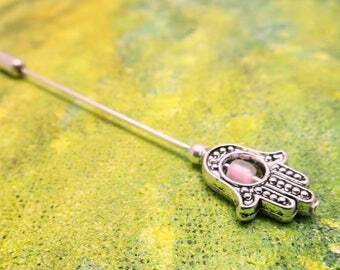 Silver hamsa hand brooch with pink glass centre. 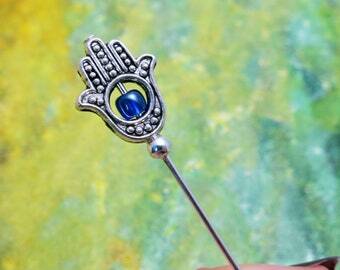 Protective Hand of God stick pin, lapel pin, tie pin, Hijab pin, blessings gift. Ceramic green floral miniature teapot stick pin brooch, hat pin: Tea lover gift, gift for Grandma, Victorian or Steampunk Tea party. 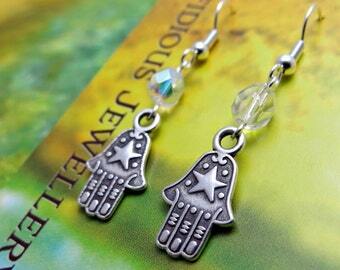 Hamsa or Hand of Fatima charm earrings, in shimmering glass and silver. 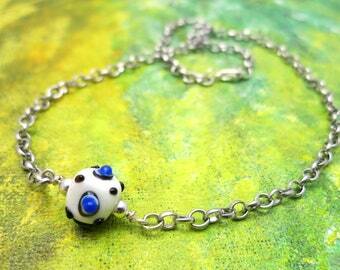 Cute good luck gift for evil eye protection. Boho amulet jewellery. 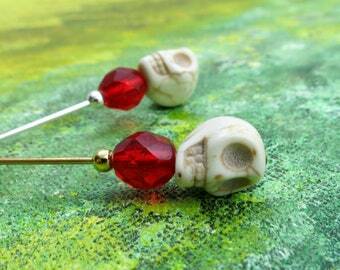 Skull stick pin in gold or silver with red glass. Ideal Gothic Valentine, or wedding accessory. Lapel pin, boutonniere, tie pin or hat pin. Blue evil eye bead protective brooch. Nazar Boncuk, kabbalah, amulet or Good luck gift, lapel pin, something blue wedding boutonniere. 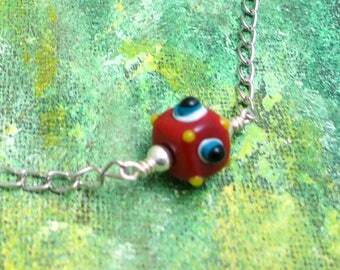 Red evil eye protective bead on silver plated necklace. Contemporary nazar boncugu jewellery, Greek mati, kabbalah. Good luck amulet gift. Expertly created as always. Quickly dispatched and beautifully presented. Thank you. Egyptian scarab beetle jewellery, silver or gold stick pin brooch, lapel, scarf, tie or hat pin. Perfect Egyptology or archaeology present. 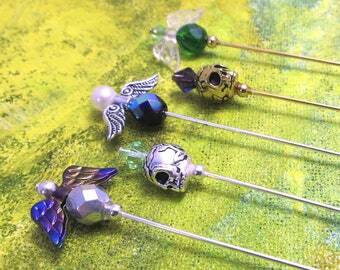 Gothic Rose and silver skull stick pin - Choice of coloured bead. Alternative wedding idea, lapel pin, boutonniere, cravat pin, hat pin. Macmillan charity sale! Pair of natural bohemian festival stacking wrap bracelets: Bangle choice of shell, glass or larger wooden beads. 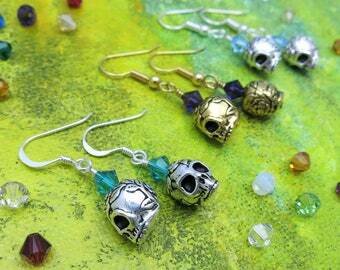 New memento mori range is now live! Remember, love and live well, for death awaits us all. Final post run of 2018, getting my final custom orders of the year on their way! Teapots in bespoke colours are hiding in here, and I've got some ready made in store still. Green and red glass miniature silver teapot charm necklace: Tea pot jewellery, Tea lover gift for a Victorian or Steampunk Tea party. My first order for Japan! This simple skull (no beads just as it is) will have an interesting journey ahead of it. Wiring a beaded hair comb. The tools of my trade! When you can't help but create, you have to share your visions! Creating and crafting is a joy for me, it's a colourful and quirky headspace away from everything else. Perfidious Jewellery is on a fun voyage of over 10 years creative experience and counting. 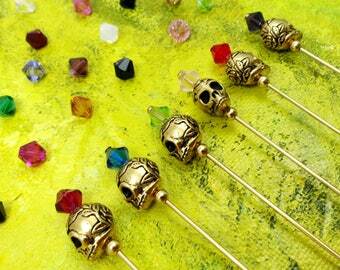 Unusual yet wearable accessories, specialising in stick pins for lapels, hats or wherever you wish to pin them. I enjoy using recycled beads, buttons and keys, so you may find a hidden side to my jewellery, in that you are helping give something old a new life. I see colours, textures or shapes and want to make them into wearable jewellery that you'll get complimented on. I'm the busy hands behind Perfidious Jewellery, I've always been called to be creative, and love making others happy with the results. Proud owner of various cats and a writer husband, living between Derbyshire and Nottingham. Keen to help in all aspects of Perfidious Jewellery, Ceinwyn is always happy to lend a paw. Or four. I can never overwork myself under her care. Mina oversees the studio and helps keep things in order. If something isn't in place, she lets me know by placing it on the floor. Marco usually works as Office Manager with freelance writer The Tower of Stars, but does a few hours a week to take some strain from the studio. To fulfil your order, you must provide me with certain information (which you authorised Etsy to provide to me), such as your name, email address, postal address, payment information, and the details of the product that you’re ordering. You may also choose to directly provide me with additional personal information. For example, dates or names for a custom order, or for items to be posted directly to a recipient other than yourself. What is yellow, and found in an apple tree? I may store and process your information through third-party hosting services in the US and other jurisdictions. (Simple example, your details might also be in emails Etsy send me, and therefore be in my email account) As a result, I may transfer your personal information to a jurisdiction with different data protection and government surveillance laws than your jurisdiction. For purposes of EU data protection law, I, Lisa Ward, am the data controller of your personal information. If you have any questions or concerns, you may contact me at perfidiousjewellery@yahoo.com. All items are attached to a card, carefully wrapped in recycled brown paper, and finished with a small hand drawn gift tag (blank on the back) attached by a sticker. They are then posted in a slim cardboard box, or padded bag. If your purchase is being sent direct to the recipient as a gift, please let me know and I can include a gift invoice with no price details. It says your orders will be processed on a future date? I sometimes take a break, perhaps to spend time sorting the studio, on holiday, enjoying some days out, or just emptying my mind! You can still place orders, or send messages, but I won't be processing or answering them until I'm back in work on that future date. I'll do my best to meet the shipping estimates, but once a parcel leaves my hands, anything from postal strikes to bad weather may impact on delivery. If the maximum date goes past and your parcel still isn’t with you, please let me know – I’ll usually ask if you’re happy to wait a few extra days, in case of delays, and then we can make further plans. The postal service in some countries will not track a parcel end to end, as well as asking for a signature. In those circumstances, your parcel will be tracked until it leaves the UK, and then a signature will be required when delivered. Although this can be frustrating ("Is it almost here yet?!") I can't influence your postal service! Tracked until leaving the UK, and signed for, is a good compromise.